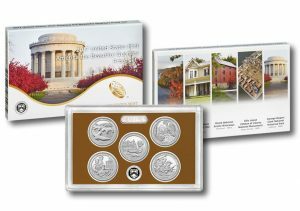 The United States Mint introduced its first product of the year last week, a 5-coin proof set of 2017-dated quarters for $14.95. 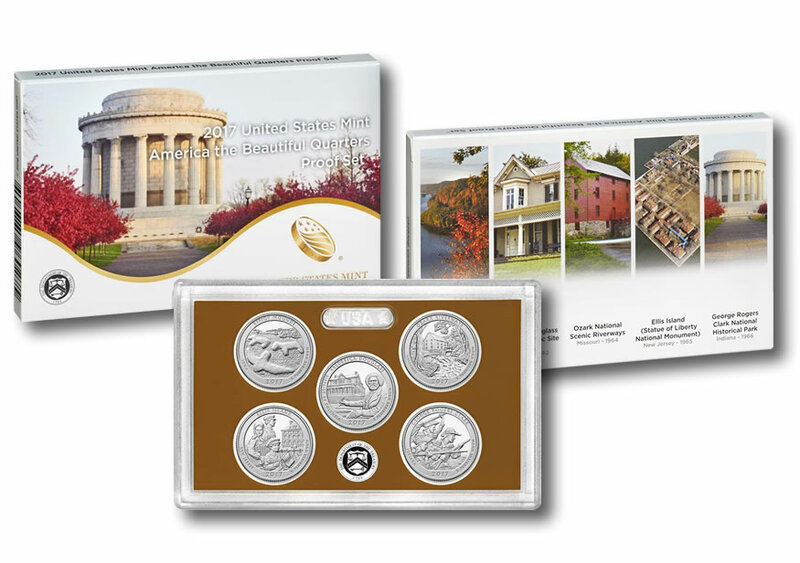 Featuring clad proof quarters with designs honoring sites in Iowa, DC, Missouri, New Jersey and Indiana, the set reached 4-day sales of 35,612. It was the U.S. Mint’s best-selling product of the week, although its starting pace was slower than past sets. *The set from last year launched on Jan. 11, 2016 but soon after saw its sales suspended because of a printing error on its packaging. The set relaunched with updated packaging on Feb. 23. Its first reported sales through Feb. 28 totaled 38,733. The U.S. Mint published sales data for 255 numismatic products. Twenty-seven of them outperformed their prior weekly gains compared to 156 previously. Five of them increased by more than 1,000 units compared to 9 previously. Fourteen products also saw their sales total reduced compared to 5 previously. Most of them logged only modest declines. Two exceptions include Fort Moultrie Three-Coin Sets, down 415 to 11,158, and Fort Moultrie Five Ounce Silver Uncirculated Coins, down 979 to 14,974. Below are tables showing the latest sales for U.S. Mint numismatic products. The sales period covers Jan. 2 to 9. Products with an asterisk (*) are no longer available. Just two coins difference between the 2013 Mac Arthur $5 Gold Unc. at 5,667 and the 2016 Mark Twain $5 Gold Unc. at 5,669. Wow, just two coins difference. So currently the four the lowest mintages modern gold coin commemoratives we have #1: 1997 Jackie Robinson $5 Gold Unc., at 5,174, #2: 2016 NPS $5 Gold Unc. at 5,198, #3: 2013 Mac Arthur $5 Gold Unc. at 5,667 and #4: the 2016 Mark Twain $5 Gold Unc. at 5,669. Seems as if 2016 was a great year for adding value to the Gold Commemoratives Coin Collector! You might want to read Louis Golino’s coin blog at coinworld.com published today about this very subject of the 2016 commemoratives mintages & what it means (not much according to him!). It will be interesting to see if the NPS Unc. get anywhere near Jackie R’$ Same for Twain & Mack the Knife, but it appears that there are alot for sale on ebay, less folks collect these for rarity as time passes. I hope the trend reverses! The most recent U.S. Mint sales figures as of January 15, 2017 reveal that the 2016-D National Park Service Uncirculated clad half dollar @ 21,030 is the lowest mintage coins of its type. The second lowest mintage modern commemorative gold coin is the 2016-W National Park Service Gold $5 Uncirculated $5 coin with a mintage of 5,180. The lowest mintage modern commemorative gold coin remains as the 1997-W Jackie Robinson uncirculated gold $5 coin with a mintage of only 5,174. By comparison, 5,180 – 5,174 = 6 is the narrow difference between the lowest mintage gold commemorative versus the second lowest mintage gold commemorative coin. NumisDudeTX I think in the long run rarity will matter. Although the commemorative series lacks consistence, US Gold coins with low mintages have always mattered and these are excellent type coins. High value metal content and low mintage I think are good combinations that do not have a lot of risk. I’m happy with those two combinations. The most recent U.S. Mint sales figures as of January 22, 2017 reveal that the lowest mintage modern commemorative gold coin is now the 2016-W National Park Service Gold $5 Uncirculated $5 coin with a mintage of 5,164. The second lowest mintage modern commemorative gold coin is the 1997-W Jackie Robinson uncirculated gold $5 coin with a mintage of 5,174.